The Curvit Division of Maclodyne Corporation manufactures production benders and coilers. In 1968 company engineers reasoned that to produce a bender that would make short runs at a profit would require a system that would substantially lower the set-up time and do so at low cost. An N/C unit would therefore have to provide three-axis control capabilities yet be comparatively low in cost. 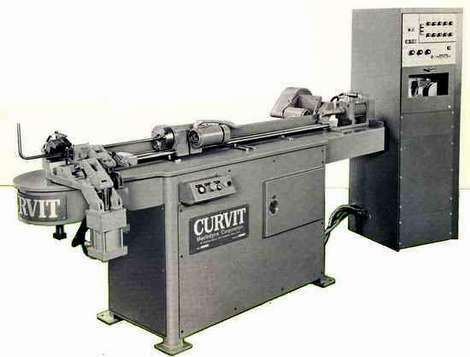 A standard three-axis SLO-SYN Numerical Tape Control was introduced to permit tape operation of the entire bending process on Curvit's AMB-4, one of the benders developed by Curvit for numerical control operation. Under numerical control, the machine advances the stock, clamps it, moves the mandrel into position, makes the bend, retracts the mandrel, releases the clamp and advances the stock to the next position where the cycle is repeated. Distance between bends, radius of bend and plane of bend are all handled automatically. The N/C tube bender represents a major advance in low cost production bending, especially in short runs where tremendous savings are realized. In a typical four-to six-bend operation, from two hours to a day and a half can now be slashed from set-up time that is considered normal for a manually operated machine. Tapes are written within 30 minutes. In addition, it provides accurate duplication, reduced scrap, elimination of operator error and simplicity of operation. One man can operate several machines, as all operations except loading and unloading are tape controlled.